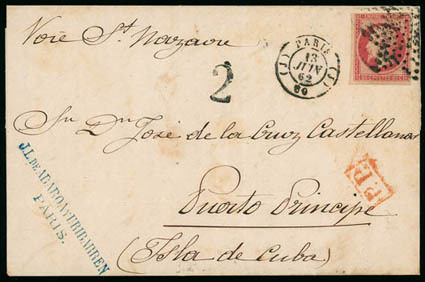 Cuba, 1828 (May 30) Havana, Cuba to Villanueva, Spain, datelined folded letter carried per Grd. 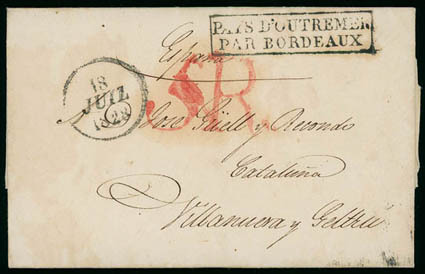 Anacréon, entered mails with "Pays D'outremer Par Bordeaux" framed handstamp, Spanish (7.18) arrival cds and large red "5R." Real de Velon due handstamp, Very Fine. In 1827, the French started a regular transatlantic service. At first this service was contracted to the Societê Gautier et Brun for a line going from Bordeaux to Mexico. 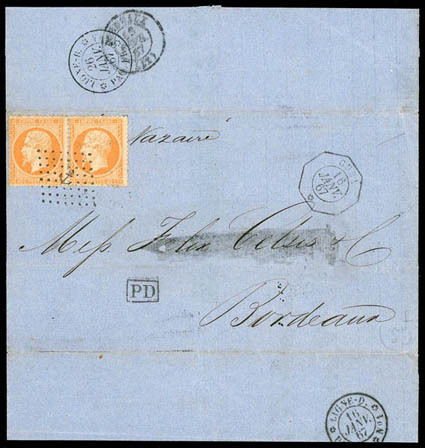 Cuba, 1850 (Jan. 8) Santiago de Cuba, Cuba to Bordeaux, France, gray folded letter with bold strike of blue "Southampton, FE 1, 1850" cds and matching "PACKET LETTER / SOUTHAMPTON" two-line handstamp, red London (2.2) backstamp and framed "Colonies/&c. Art. 13" framed accountancy handstamp, red Calais entry cds and manuscript "30l decimes due rating, Bordeaux (2.5) arrival backstamp, Very Fine. Cuba, 1862 (Apr. 12) London, England to Mexico City, Mexico, blue folded letter with red "Lombard Street, Paid Ap 12, 62" origin cds and "Via France" directional handstamp and endorsed "St. Nazaire", red "PP" double-circle handstamp, red Calais (4.15) transit cds, sent on the maiden voyage of the new French Transatlantic Service Louisiane, Vera Cruz "2" inland due handstamp, Very Fine, ex-Schimmer. Cuba, 1862 (Jun. 13) Paris, France to Puerto Principe, Cuba, folded letter bearing France 80c rose (20) tied by dotted Star cancel for up to 7.5 grams, matching "Paris, 13 Juin 62" cds and matching "2" handstamp, red "P.P." framed handstamp, carried on the Maiden Voyage of Cie. Générale Transatlantique Floride via St. Nazaire (6.14), Fort de France (6.30), Vera Cruz (7.15) to Santiago de Cuba (7.21), Very Fine. 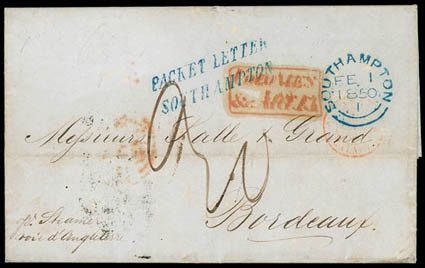 Cuba, 1863 (Jan. 20) Santiago de Cuba, Cuba to Nantes, France, blue folded cover with bold "Cuba, Louisiane, 22 Janv." 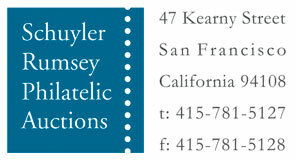 octagon datestamp and matching "8" decimes due handstamp for up to 7.5 grams, carried by Cie. Générale Transatlantique Louisiane via Fort de France (1.28) and St. Nazaire (2.12); minor scuff, Very Fine. Cuba, 1863 (Mar. 23) Santiago de Cuba, Cuba to Nantes, France, blue folded cover with bold "Cuba, Floride, 23 Mars 62" octagon datestamp and matching "8" decimes due handstamp for up to 7.5 grams, carried of the 3rd Voyage of the Cie. Générale Transatlantique Floride via Fort de France (3.27) and St. Nazaire (4.12), Nantes (4.13) arrival backstamp, Very Fine. 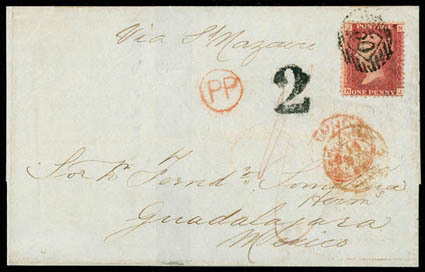 Cuba, 1863 (Aug. 14) London, England to Mexico, folded letter with "London, AU 14, 63" backstamp and matching "12" ovals tie G.B. 4d vermilion, strip of four for two-times the 8d rate per ½ oz., red "PP" oval handstamp, endorsed "per St. Nazaire", red Calais (8.15) transit cds, carried per Cie. Générale Transatlantique Vera Cruz via Fort de France and Santiago de Cuba, arrived Sept. 21st, Mexico "4" Reales inland postage due handstamp, Very Fine, ex-Victoriana. 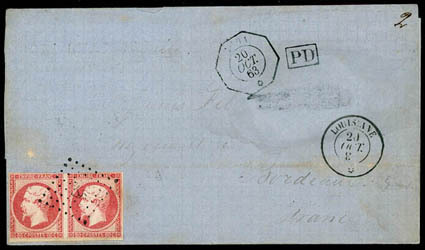 Cuba, 1863 (Oct. 20) Santiago de Cuba, Cuba to Bordeaux, France, gray folded letter with "Cuba, 20 Oct. 62" French Consulate octagon datestamp and matching "PD" framed handstamp, bearing France 80c rose (20) horizontal pair tied by anchor lozenge, clear strike of "Louisiane, 20 Oct." cds, carried on the 4th voyage of Cie. Générale Transatlantique Louisiane via Fort de France (10.26) and St. Nazaire (11.9), Bordeaux (11.10) arrival backstamp; surname blacked out, Fine and scarce use. The round handstamps where struck to the letters, when registered directly to the postal agent aboard the ship, while the octagonal ones were given to the Consulate in Santiago first. Cuba, 1864 (Jun. 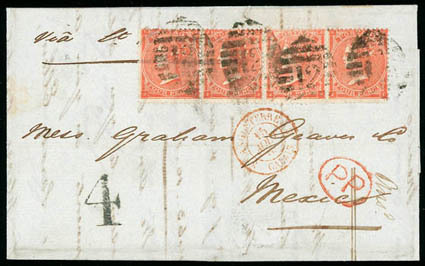 14) London, England to Guadalajara, Mexico, folded cover bearing G.B. 1d red tied by "50" barred oval, red London (6.14) origin cds and matching "PP" circle handstamp, red manuscript "1/-" prepaid rating, endorsed Via St. Nazaire", Calis (6.15) transit cds, carried per Cie. Générale Transatlantique Tampico via Fort de France and Santiago de Cuba, arrived July 25th, Mexico "2" Reales inland postage due handstamp, Very Fine, ex-Victoriana. 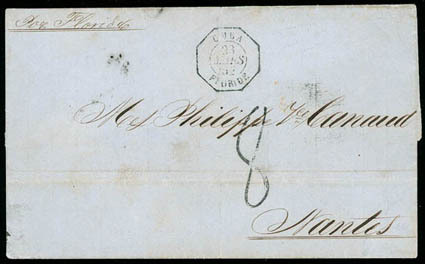 This letter was prepaid one shilling in cash for up to ½ oz. plus 1d late fee. 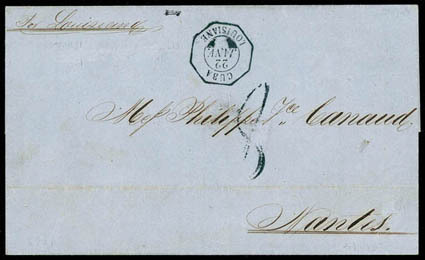 Cuba, 1867 (Jan. 16) Santiago de Cuba, Cuba to Bordeaux, France, blue folded letter with "Cuba, 16 Janv. 67" French Consular octagon datestamp and matching anchor lozenge ties France 40c orange (27) horizontal pair, small framed "PD" handstamp, "Ligne-D, Paq. Fr., No. 1, 16 Janv. 67" and "Ligne-B, Paq. Fr. No. 4, 26 Janv. 67" backstamps, carried per Imp. 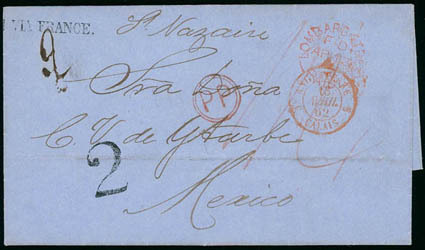 Eugénie to St. Nazaire arriving Dec. 2nd, Bordeaux (2.13) arrival backstamp; addressee name crossed out, small erosion spot, Fine. From December 1866 until March 1867, as a result of an epidemic yellow fever on St. Thomas, French ships had to land at Fort de France (Martinique) to embark mail originating from the Danish colony, while British, Danish and U.S. ships embarked mail at Water Island.